IN THE FOOTSTEPS OF MARCO POLO, premiering on public television beginning November 2008 (check local listings), chronicles the journey of two ordinary guys – Belliveau, at the time a wedding photographer, and O’Donnell, an artist and former Marine – as they set out to follow Polo’s historic route. Equal parts travelogue, adventure story, history trek and buddy movie, the 90-minute film weaves footage from the duo’s often perilous voyage with Marco Polo’s descriptions and experiences. Richly enhanced with Belliveau’s award-winning photographs, the program details their highs and lows as they retrace Polo’s path, trying to see what he saw and feel what he must have felt. IN THE FOOTSTEPS OF MARCO POLO captures the pair as they survive a deadly firefight and befriend a warlord in Afghanistan, cross the forbidding Taklamakan Desert in a Silk Road camel caravan, endure continuous interrogations from authorities, and live among cultures ranging from the expert horsemen of Mongolia to the tattooed tribes of Indonesia. In the spirit of history’s great adventurers, the two make their way across the world’s largest land mass and back, securing – or, when necessary, forging – visas, surviving extreme temperatures, and talking their way out of jams brought on by Tajik soldiers, Chinese security officers, and an assortment of other bureaucrats, border guards and armed warriors. “We made it the 13th century in our heads,” said Belliveau. “What was this like for Marco? How would it have been for him? We were going to try to make this whole journey like we were living in Marco Polo’s world.” Without the assistance of air travel, they made their way on foot, horseback, camelback, in jeeps, trucks, boats and trains. But as fascinating as the world looked through Marco Polo’s eyes, is the world and the people Belliveau and O’Donnell saw through their own. “Travel is the enemy of bigotry,” says O’Donnell. “There’s a lot more good people on the planet than bad…Get out there, meet [people], they’re good,” adds Belliveau. 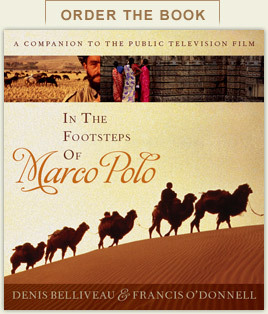 IN THE FOOTSTEPS OF MARCO POLO is produced by Return to Venice LLC and WLIW21 in association with WNET.ORG. Executive Producers: Tom Casciato, Josh Nathan and Stephen Segaller; Producer: Emir Lewis; Writer: Tom Casciato; Senior Producer: Eva Anisko. For Return to Venice LLC: Producer/Directors: Denis Belliveau and Francis O’Donnell; Executive Producer: Lisa Taylor. The program is presented nationally by WLIW21 and distributed nationally by American Public Television. Funding for IN THE FOOTSTEPS OF MARCO POLO is provided by The Starr Foundation and the Center for Cultural Interchange.